The Hadean is a geologic eon of the Earth, and lies before the Archean. It began with the formation of the Earth about 4.6 billion years ago and ended, as defined by the ICS, 4 billion years ago. The geologist Preston Cloud coined the term in 1972, originally to label the period before the earliest-known rocks on Earth. W. Brian Harland later coined an almost synonymous term: the "Priscoan period". Other, older texts simply refer to the eon as the Pre-Archean. Nonetheless, in 2015, traces of carbon minerals interpreted as "remains of biotic life" were found in 4.1-billion-year-old rocks in Western Australia. In the last decades of the 20th century geologists identified a few Hadean rocks from Western Greenland, Northwestern Canada, and Western Australia. The oldest dated zircon crystals, enclosed in a metamorphosed sandstone conglomerate in the Jack Hills of the Narryer Gneiss Terrane of Western Australia, date to 4.404 ± 0.008 Ga. This zircon is a slight outlier, with the oldest consistently-dated zircon falling closer to 4.35 Ga—around 200 million years after the hypothesized time of the Earth's formation. A sizeable quantity of water would have been in the material that formed the Earth. Water molecules would have escaped Earth's gravity more easily when it was less massive during its formation. Hydrogen and helium are expected to continually escape (even to the present day) due to atmospheric escape. Part of the ancient planet is theorized to have been disrupted by the impact that created the Moon, which should have caused melting of one or two large areas. Earth's present composition suggests that there was not complete remelting as it is difficult to completely melt and mix huge rock masses. However, a fair fraction of material should have been vaporized by this impact, creating a rock vapor atmosphere around the young planet. The rock vapor would have condensed within two thousand years, leaving behind hot volatiles which probably resulted in a heavy CO2 atmosphere with hydrogen and water vapor. Liquid water oceans existed despite the surface temperature of 230 °C (446 °F) because water is still at an atmospheric pressure of above 27 atmospheres, caused by the heavy CO2 atmosphere, water is still liquid. As cooling continued, subduction and dissolving in ocean water removed most CO2 from the atmosphere but levels oscillated wildly as new surface and mantle cycles appeared. Study of zircons has found that liquid water must have existed as long ago as 4,400 million years ago, very soon after the formation of the Earth. This requires the presence of an atmosphere. The Cool Early Earth theory covers a range from about 4,400 to 4,000 million years ago. A September 2008 study of zircons found that Australian Hadean rock holds minerals pointing to the existence of plate tectonics as early as 4,000 million years ago. 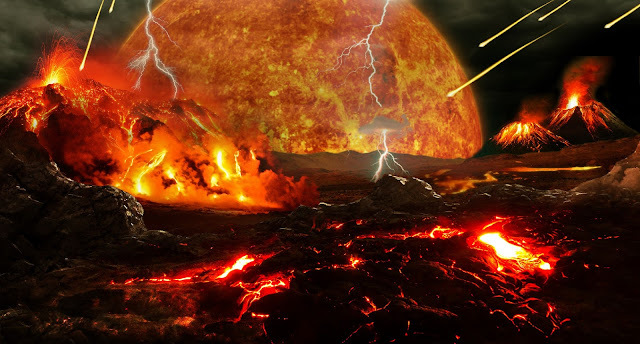 If this is true, the time when Earth finished its transition from having a hot, molten surface and atmosphere full of carbon dioxide, to being very much like it is today, can be roughly dated to about 4.0 billion years ago. The actions of plate tectonics and the oceans trapped vast amounts of carbon dioxide, thereby eliminating the greenhouse effect and leading to a much cooler surface temperature and the formation of solid rock, and possibly even life. Very interesting ! As the Antarctic melts, we will have more conclusive evidence of periods well beyond! A very useful Update with varieties of facts.My profound regards to NASA, Google and other contributing Agents.